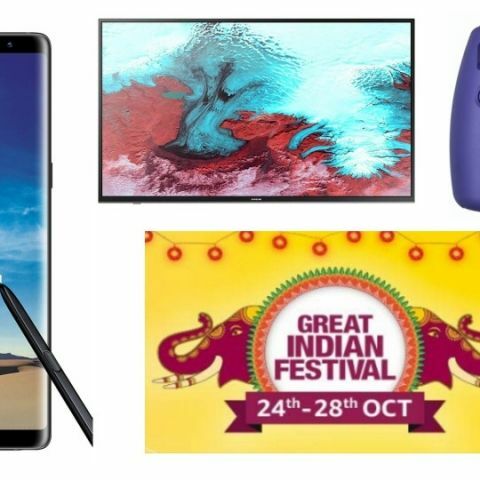 Here take a look at some of the best tech deals that are available on Amazon Great Indian Festival Sale opening day. Amazon Great Indian Festival sale kicks off today and will go on till October 28. Those who missed out the last sale now have an opportunity to grab something at a discount price. The sale is back with TVs, smartphones, and more. Further, Amazon is also offering 10% discount on payments made through ICICI Bank debit/credit card. So, let’s get started. The Samsung Galaxy A8+ was launched on Amazon for Rs 29,990, but during this sale, the device can be purchased at Rs 23,990. It has a 6.4-inch FHD+ display that offers a resolution of 1920 x 1080 pixels. The phone comes with a dual 16MP + 8MP front camera along with a 16MP sensor at the back. View deal here. The Xiaomi Mi A2 is available with a flat Rs 2,500 discount during Amazon Great Indian Festival sale. One can also get an additional 10% discount on this purchase when they will use CITI Bank debit or credit card for payment. View deal here. The Honor 7C can be bought at Rs 8,499 at the sale down from its launch price of Rs 12,499. The smartphone comes with a 5.99-inch HD+ LED display that offers a resolution of 720 x 1440 pixels. It has a dual 13MP + 2MP dual-rear camera setup with an 8MP sensor on the front. View deal here. The Samsung Galaxy Note 8 that was launched last year at a price of Rs 67,900, is now available at the sale for Rs 43,900. The Samsung flagship smartphone features a 6.3-inch QHD+ display that offers a resolution of 1440 x 2960 pixels. The phone comes with a dual 12MP rear cameras and 8MP unit on the front. View deal here. The One Plus 6 is one of the most popular devices of its segment. The 128GB variant is now available at the Great Indian Festival Sale for Rs 34,999. One can get this device for as low as Rs 32,999 (appx) including CITI Bank 10% discount. This can be the last time you will be able to purchase the OnePlus 6 at this much lower price. With the launch of OnePlus 6T, there are chances that you may not able to find the OnePlus 6 in stock frequently. View deal here. The Samsung 43-inch Full HD LED TV offers a resolution of 1920 x 1080 pixels. The TV comes with multiple HDMI and USB ports to connect external devices such as a Fire TV stick, camera, laptop and more. You can get this device at this sale for Rs 29,990. View deal here. If you have a limited budget and you are looking for a TV with a panel size of more than 43-inches, then the Sanyo 49-inch IPS LED TV might be the right one to purchase. It has two HDMI ports and two USB ports as well to connect external devices. The TV is now on sale can be bought at a price of Rs 23,990. View deal here. The JBL Flip 3 is a wireless music streaming device that can be connected to up to three smartphones at once. The speaker packs a 3000mAh battery that can last up to ten hours. You can get the JBL Flip 3 at the sale for Rs 5,749 down from its original price of Rs 9,999. View deal here. The HP 15 is powered by an Intel Core i3 6th Gen processor, which is paired with 8GB RAM and 1TB hard drive. The laptop is now available on Amazon sale at a discounted price of Rs 34,990. View deal here. The Fujifilm Instax Mini 8 is a stylish handy camera, which instantly takes photos and develops them right away. The camera is available in a variety of colors such as pink, blue, purple, white and more. It is now available at the sale for Rs 3,000. View deal here.